Syllabus of the Online Course (Subject): European Court of Auditors (European Union). The objective of the Online Course / Subject “European Court of Auditors” is to understand the role of the European Court of Auditors as the financial supervisor of the European Union. Learning materials in or Tribunal de Cuentas UE Cour des comptes UE Tribunal de Contas Europeu. 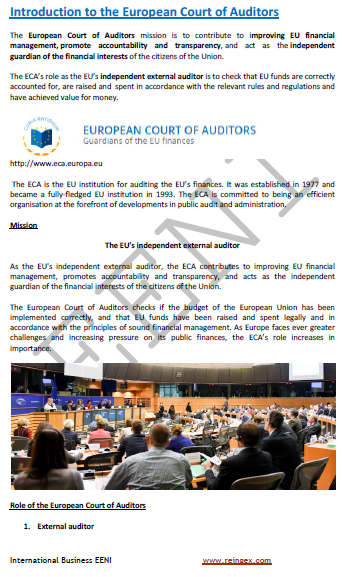 In 1997, the European Union set up the European Court of Auditors to verify that the EU funds are used correctly and improve financial management of the European Union. All the countries of the European Union (Austria, Belgium, Bulgaria, Croatia, Cyprus, Denmark, France, Estonia, Finland, Germany, Greece, Hungary, Ireland, Italy, Latvia, Lithuania, Luxembourg, Malta, the Netherlands, Poland, Portugal, Slovakia, Slovenia, Spain, the United Kingdom (BREXIT), the Czech Republic, Romania, and Sweden) are members of the European Court of Auditors of the EU. The European Court of Auditors belongs to the European Economic Area (Western Civilisation).